We realise that the thought of ever venturing outside again may seem like a long off dream but we promise, the sun will shine eventually and when it does you will want your home and garden to be fully ready for all the barbecues, the garden parties and yes, maybe the occasional solo alfresco G&T. We reckon the perfect way to make the most of your home during the warm summer months (ah remember those?) is to ‘bring the outside in’. We know this is a bit of a cliche now, but really who doesn’t want the extra light and the illusion of more space? And patio doors are a great way to achieve this. Bi-fold doors are a great choice for creating a flow between your patio and your indoor spaces. They are easy to use, budget friendly and when open they are completely tucked away, something you don’t usually get with sliding doors. The Kloeber KustomFold aluminium bi-fold doors are sleek and contemporary. The slim frames, don’t really interrupt the expanse of glass so you still get a lovely clean look. Plus you can choose from any RAL colour (over 200) and you always have the option to choose a different colour for the inside and outside of your doors. 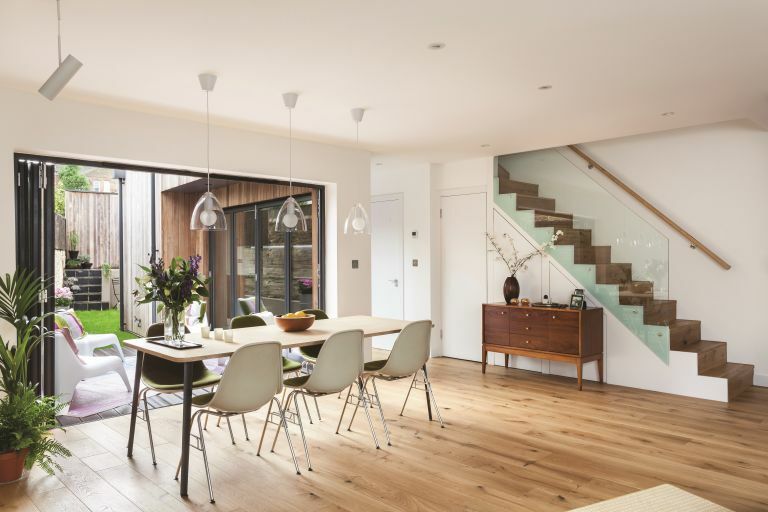 Sliding doors are fully shaking off their 1960s vibes and are increasingly becoming a really popular choice for adding a load of light and opening up a space. Kloeber’s UberSlide doors have super thin, basically invisible frames, that result in a really clean look that doesn’t distract from anything else going on the in room. Obviously, with sliding doors there are no sections to fold back as you would have with bi-fold doors so they are a great option in a smaller space. ‘Crittall’ style is very on-trend at the moment, and we are pretty much obsessed with black metal framed windows. The Kloeber aluminium French doors nail this look and what we love about this design is that you have the option to choose a slimmer frame for a more contemporary style. Plus the slimmer frames match Kloeber’s aluminium bi-folds so you can mix the two if you want more than one set of patio doors. Metal doors and windows may be having a bit of a moment right now, but if you prefer a more traditional look, opt for timber framed patio doors. Kloeber KustomFold timber frames are available in solid engineered softwood, hardwood and oak and can be can be stained or painted in any RAL colour.